Our online textbook buyback can buy your textbooks. Students and academics may be interested in trying our online textbook buying program. It is widely known that new and used books are excellent educational tools and have academic reference value. On occasion, students may find they have extra reading materials which they may not be needing for any future use. That's where our buyback may be useful, because it is an opportunity to try to sell used textbooks via our web based book buy back. To use our buying program, find either the 10 digit ISBN number or the 13 digit EAN number that corresponds to your books, go to our homepage here and enter those barcode numbers into the window. Whether you have one or many to sell, all the ISBN numbers can be entered in all at the same time. It doesn't make any difference whether you type them in using commas or spaces or use the return or enter key on your keyboard. Sometimes you might see dashes in the ISBN numbers; you can leave those out, or leave them it. When you are finished entering in all the numbers, click the "TEXTBOOK BUYBACK" button and our online program will instantly display our new and used price quotes for the new and used media you may have and are wishing to sell. Experts at Buying Back Text Books. We are experts at buying used college textbooks. 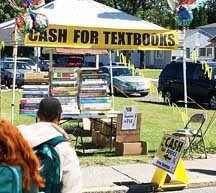 Our college textbook buyback has a nationwide customer base—we've been online buying textbooks since 1999. Our buyback even buys back lab manuals, study guides, literature and history textbooks, books about reading, mathematics, physics, college algebra, and humanities. We encourage you to give our online buyback a try, from start to finish, to see how easily you can sell us your books. Our service offers a buyback program; we define "textbook buyback" as a venue for used textbooks to be bought. We can buy those unwanted books; if you have unwanted college texts that you no longer need, please enter the ISBN numbers of those textbooks onto our website, and if our Price Quote page shows a price for those books, send them to us, because we want to buy them. Textbook buyback: for your used college texts. Book buy back: for your used resources. Buy back: for your academic books. College textbook buy back: for students attending college. College book buy back: for academics in higher educational institutions. Textbook buy back online: for students visiting the web. Used textbook buy back: for individuals with used books. Textbook buy back online: for those wishing to sell books. Textbook Buyback for those in Universities in Texas, Alabama campuses, Mississippi education institutions, South Carolina vocational schools, New Mexico, Michigan, Florida higher education, Tennessee, Ohio, New York study groups, Indiana school systems, Illinois, Wisconsin colleges, Nebraska, North/South Dakota universities and college, Oklahoma learning centers, Montana, Idaho educational facilities, Oregon, Virginia, Colleges in Alaska, Washington, Utah college and university campuses, Arkansas, Pennsylvania research facilities, and all other cities and states. This includes business, business mathematics, advanced accounting, intermediate accounting, accounting theory, and introductory accounting. This includes general biology, introductory biology, oceanography, ecology, plant physiology, horticulture, advanced biology, biological science, and intermediate biology. This includes any textbook having to do with business, including business management, business ethics, human resource management, managing human resources, labor relations, entrepreneurship, introductory business, intermediate business, advanced business, financial planning, and personal finance. This would include biochemistry, advanced chemistry, introductory and intermediate chemistry, as well as textbooks on lab experiments. The topic of communication includes communication theory, the art of communiating, debate, speech, and being relaxed while communicating your thoughts. Communication is a great subject. This would include educational instruction, education, educational administration, becoming a teacher, and educating people. Once you have been educated, you may wish to either keep or sell your text books. English topics may be grammer, reading, punctuation, writing paragraphs, determining where to put a comma, and various english-related topics. You can sell english textbooks if you don't need them any more. History is a broad subject including historical ideas, pre-history, historical events, the ancient civilizations, civilian thoughts and theories, the history of art, and the history of a great deal of things. History can truly be an exciting subject. The exciting topic of mathematics may include algebra, calculus, geometry, differential calculus, analytic geometry, counting, fractions, triangles and squares. Mathematics can be a very fun subject, especially if you like counting. Chemistry, physics, and biology are science related subjects. Physics studies many things including particles, atoms, and how things fall. If an apple falls out of a tree, will it hit the ground? This includes mechanical topics, gears, bridges, and concrete structures that use mechanical parts. Our customers and visitors are welcome to contact us at any time via phone, postal mail, or email. If you have unwanted used college textbooks in your library, on your desk, or stored away, please consider trying to sell them to our book buyback web site. By entering the ISBN numbers (or the EAN numbers) from the text books you wish to sell onto this site, you may be presented with instant online price quotes. Those price quotes are our offering prices ("buyback prices") per the terms and conditions of this website. Many students and graduates have used our service and have had an exceptional and enjoyable time using our site.